Melanie Hohertz is the online communications lead at the multinational corporation Cargill – the largest privately held corporation in the United States. Cargill has 140,000 employees worldwide of which about 60,000 have regular access to company computers. At the time of the interview in July, 2013, their enterprise social network (Yammer) included about 12,000 employees and was growing steadily. I interviewed Melanie for my book Internal Social Networks The Smart Way. NB: Melanie will be speaking about her experiences at the Microsoft Sharepoint conference. The hashtag for her session is #SPC295. Virpi: Did you do a Yammer launch? If so, what did you do and did it work? Melanie: Cargill launched Yammer as a company-wide official work platform in August, 2012. Our network had been live for several months beforehand. During that time we hosted several carefully selected pilot groups. This soft launch gave us time to refine our processes and user support collateral. It also ensured that by the time we welcomed our first wave of mass adoption, new users were dropping into an existing village rather than a blank space. People could look around, join some groups that were already well-established, and infer the norms for posting and teaming. We had experienced power users to help, too. Our launch “event” in our earliest days was a YamJam by our chief financial officer, delivered immediately after a global town hall on financial results and operational priorities. The YamJam was promoted on the company intranet, in the Yammer network, and with distributed resources such as article text and poster copies to Cargill’s global communicators for placement in their own channels. The CFO YamJam was considered a great success, with dozens of employee questions answered over several hundred posts in a short period of time. Once he was provided with a summary of the metrics and themes of his YamJam, the CFO forwarded it to other members of the leadership team, playfully warning them that they too would “meet the Yammer.” This was the beginning of a culture of YamJams at Cargill, with 17 so far in the first year. Virpi: How do you motivate senior managers to use Yammer? Any tips and tricks you can share? Melanie: Senior managers were the target of our early sheet titled, “More Value in Less Time.” We offered tips like getting email notifications optimized; using private groups; scheduling 10 or 15 minutes for Yammer once a week; and installing the Yammer app on both personal and company mobile devices. We personally installed apps on a few c-suite mobile devices. We look for ways to infiltrate existing leadership events and communication plans. For example, we partnered with the organizers of our bi-annual leadership forum to deliver a Yammer-enabled event for in-person and virtual attendees. All attendees were invited to participate in Yammer by a member of our C-suite and were offered small-group and individual training. In addition, we look for other ways to integrate Yammer into communication strategies. For example, by encouraging senior leaders to post thoughts, photos and recognition to Yammer via email during their annual visits to global facilities. As we increasingly look to move leaders from event-driven to day-to-day interaction, we are heavily communicating Yammer’s integration with Outlook email. People can post to Yammer from email, including pictures and files. Once managers are set up to do this, and global communicators get in the habit of reminding them intermittently, we expect that changes in habit will slowly take hold. Meanwhile, we routinely “mention” managers to call them to conversations. This pushes messages into their email and is an effective (if reactive) way to engage them. Virpi: How can internal communications officers/other staff support senior managers to make most of Yammer? Melanie: Often senior managers will trust internal communications officers or admins to log into their account or “sit at the computer and drive” to get those managers optimally set up in Yammer. That means streamlining their email notifications to deliver only useful messages and not spam related to likes, followers or new Yammer features. It may also mean clicking on the email addresses for useful Yammer groups so that the addresses will be stored in Outlook and ready to be called up at a moment’s notice. Communicators can also point out to senior managers that Yammer is a no-cost way to extend the visibility, dialogue potential, and search availability of communications created for other channels. Why not extend the value of painstakingly crafted memos, town hall presentations, etc.? Similarly, any leader who emails is capable of hosting a YamJam, which is an opportunity like none other to not only offer direct access to a manager, but for the manager to listen and reflect what they’re hearing straight from employees. The recent addition of a translation feature in Yammer has made the YamJam value proposition even stronger. Virpi: There are always people who refuse/don’t see the benefit of Yammer. It can be a professional group (like security guards) or it can be a demographic (baby boomers). Have you tried to engage a group like this and if so how? Did you succeed? Melanie: Cargill’s extensive, global research and development job family could be considered passively resistant to Yammer. Early on, senior leaders in this area were openly skeptical of the value of the platform, and also, the stereotype is that many of Cargill’s scientists are a) engrossed in incredibly specialized research projects and b) more than a bit introverted. Partnering with Yammer champions in this area has yielded progress with adoption and engagement. The number of R&D colleagues comfortable posting in Yammer has slowly grown, and a recent regional leadership forum was Yammer-enabled to support polling and virtual discussions. A Yammer group feed has also been enabled on the job family’s intranet. The key has been patience and persistence, with the champions embedded in this area driving all the gains. Melanie: Weekly check-in meetings can be an easy sell. If you have a group that meets to review what is happening that week, posting individual updates to the group and shortening or cancelling that meeting is a quick win. In addition, PowerPoints uploaded to Yammer can take advantage of an in-browser file markup capacity with highlighting, drawing, overtyping and inline comment callout. Plus, soon Yammer will introduce in-Yammer file editing capacity. One thing that I always point out as a source of Yammer efficiencies is meeting agendas, presentations and notes. Agendas are often collaborative, and Yammer Notes for agendas makes tremendous sense. Uploading a presentation means that even if WebEx fails, everyone has the materials; no need to mail around a multi-MB file which will then take up space in multiple personal Inboxes and team SharePoints. Finally, keeping meeting Notes in a Yammer Note mean they can be co-created, edited with version control, and easily found later via Yammer search. Melanie: We consider social collaboration as the glue that holds our many collaborative efforts together. So we don’t have an “either-or” mindset. For example, we encourage our users to interact with Yammer from Outlook if that is what will drive value for them. We also believe that market forces will continue to blur the boundaries between email, instant messaging and social collaboration tools. This will also help move from a tool to a behavior mindset. Virpi: How did you recruit your Yammer champions? Melanie: Our Yammer champions generally self-recruit. We might identify them due to their network participation, but more often, they ask to join our private group for Yammer Power Users within our network. Virpi: What do your Yammer champions do in practice? Virpi: How do you keep your champions motivated (do they have their own Yammer group, do they meet each other regularly etc)? Melanie: We host quarterly updates about recent and coming features in our Yammer network, so champions are always in the know on latest-greatest and can be the local expert. Our champions are also regularly called on to help with high-profile YamJams with c-suite members. Further, our trained power users are given access to the Yammer Customer Network, whereas we are otherwise limited so far in our provisioning for external networks. Plus we offer them a Wild-West-deputy style gold star to be added to their Yammer profile picture. Virpi: Yammer and other enterprise network tools break down silos and hierarchies. But in my experience you can also create new silos on Yammer with Yammer groups. How do you solve the problem of “Yammer silos”? Melanie: We have observed an emerging pattern in our network favoring private groups. These might be considered “silos,” but Yammer groups are a collaborative workspace with the capacity to “work out loud.” A private group still offers a better teaming platform than individual email accounts. We do encourage community managers to consider whether they really need to have a private group, and some have responded by changing over to public. In addition, Yammer has introduced a feature enabling group admins to “relate” groups, encouraging visibility and cross-pollination between groups linked this way. We don’t yet consider private groups or community fragmentation as a pressing problem to solve. Our current challenge is to grow people’s collaborative skills and engagement and change their daily work habits. If we can build that skill set, the step to collaborating outside of your workgroup becomes more natural. 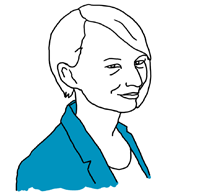 Virpi: What is the biggest benefit Yammer has brought your organisation? Melanie: Cargill brought in Yammer to make money, save money, and create business opportunity. It does this through engaging people to share and use what Cargill knows. We have collected examples in our first year of all three measures of value. So far the leader is probably “save money.” It’s been extremely interesting to see the range of expertise and solutions shared within Cargill that save time, solve problems, identify an internal resource, avoid rework, support process awareness and compliance, and promote shared services like Strategic Sourcing. 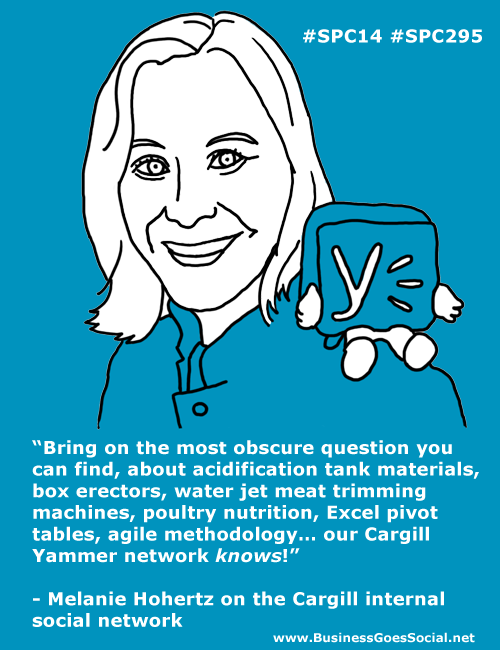 Bring on the most obscure question you can find, about acidification tank materials, box erectors, water jet meat trimming machines, poultry nutrition, Excel pivot tables, agile methodology… our Cargill Yammer network knows! You can reach Melanie through LinkedIn.